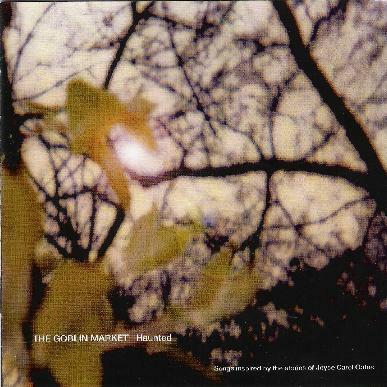 The Goblin Market - "Haunted"
The Goblin Market is a side project from Green Pajamas' members Jeff Kelly (GP founder) and Laura Weller. Haunted is the follow up to their 2001 debut, Ghostland, and each song on the set is inspired by novels, short stories and poems by American author Joyce Carol Oates. I've never read any of Oates works, but my mother has been a fan for many years and given the comments she has made I wasn't surprised to see a reference on the promo sheet to the author's "uniquely dark vision". Dark, though by no means depressing, is very much the theme of the aptly titled Haunted. The CD begins with "Dark Days", an atmospheric psychedelic song. I love Laura Weller's voice. On this tune it has a warbly, off kilter, yet charming quality that reminds me of Deb Young, former singer for Architectural Metaphor. A strong opening track. Other highlights among the dozen songs on the album include "Beast", which is somber, moody and folky, yet quietly symphonic, and it's got a melody that kills! I really dig the acoustic/orchestral mix on "First Love". "Haunted" is like a theatrical, psychedelic Phantom of the Opera orchestral folk-prog number. "Calla" alternates bewteen Kurt Weill inspired Dagmar Krause song and piano/orchestral folky show tune. "Cruel Rapids White" is a cool psychedelic-country-folk tune with a Neil Young flavor. "The Tattooed Girl" is another excellent song with a distinct, yet very different take, on the Neil Young sound. And at 8 minutes, "The Model" is by far the longest track of the set. It's valium paced and brooding, in a Nick Drake kind of way. Yet it's also characterized by subtly complex and beautiful music, with a floating cosmic sense that really captivated me. Goblin Market aren't a psychedelic band per se, but are very much so in spirit and atmospheric vibe. And they've got a grasp of melody that I found truly enchanting throughout the album. Very nice.